Over the last year I have standardised on the ESP8266 for all my small IoT projects. Its low price, ease of use (now that the Arduino IDE is available), tiny size and built in Wi-Fi makes it a compelling option. Using Wi-Fi is a convenient way to link your newly created IoT device into your existing IT infrastructure – including cloud services – but it also has a drawback. Wi-Fi’s demand for power usually makes battery operation impractical for any real deployment. I have been able to get around this issue for most of my projects (e.g. the train and the smart shelf described on this blog) because they are for demonstration purposes only, requiring the battery to last no longer than a few hours. Nevertheless, it is possible to put the ESP8266 into deep sleep and wake up periodically to check and activate Wi-Fi only when required. 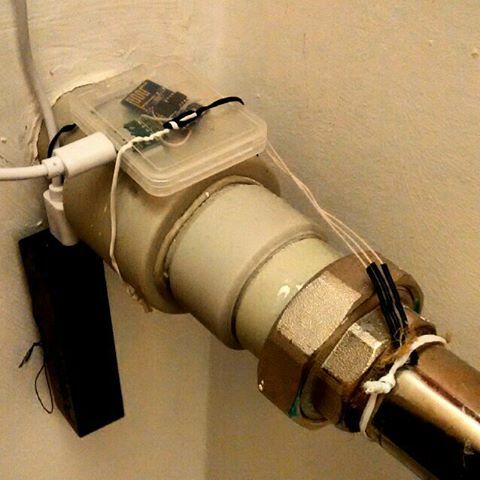 This would suit a scenario in which an IoT sensor sends relatively infrequent one way traffic (i.e. where real time control of the device is not needed). I wrote about the ESP8266 deep sleep option more than a year ago, but have not explored it any more until recently, when exactly such a project arose. The other thing that I have done over the last year is to standardise on using the NodeMCU (hardware, not the LUA software). Especially when rolling out multiple small projects, it is immensely convenient to be able to plug a device into a USB port and just program it (automatically without having to wire up serial pins and then get the correct pins tied high / low for flashing / running). With no need to worry about providing 3.3V power, adding capacitors to prevent the ESP8266 power spikes from causing instability, or adding a resistor + cap for a power-on reset. No need to scale down the ADC input to 1V or to add my own test led… and all of this in a breadboard friendly package. Also, just to be clear for those who may wish to follow along, I always use the “second generation” NodeMCU known as v2. The different versions are described here and I agree with that poster – i.e. don’t buy the v3 variant because its larger size means that it leaves no free breadboard holes on either side. Unfortunately, with all this added convenience comes the drawback of added power consumption, which continues even when the ESP8266 is in deep sleep. I measured 18mA to the NodeMCU board while the ESP8266 was in deep sleep mode – orders of magnitude more power hungry than I was looking for. So for my iot-container project, I sought to retain the convenience of using the NodeMCU, but to address its power consumption shortcomings to allow battery operation. Read further to hear what I did. The two immediate suspects are the power regulator, and the UART, as discussed in the forum here. The first step is to target the power regulator. The AMS1117 LDO draws a quiescent current of “typically” 5mA. To prevent this, it may be sufficient to lift just pin 1. However, I chose to remove the whole chip to free up space for later. 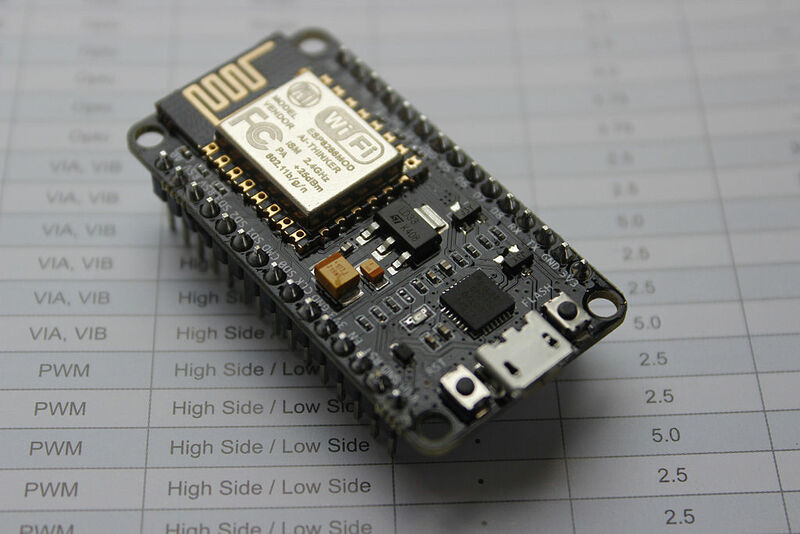 You won’t need the LDO if you supply your own power directly to the 3.3V pin of the NodeMCU. I often use a single cell Li-Ion battery via a 1N4001 dropper diode. Note that from now on you will need to supply this power, even if a USB cable is connected for programming / monitoring. Place a small amount of flux and solder on the pins, starting with the big tag, and it should lift easily. Then remove the remaining 3 pins. Without the LDO, I measured a saving of 3mA. Now for the biggest saving – to disable the USB UART. This can be done with reference to the NodeMCU schematic by cutting power to pins 6 and 7. Congratulations! You will now have reduced power consumption by some 360x to around 50μA 20μA [Updated 28 Jan 2017 when I was powering only the NodeMCU, without additional circuitry]. Earlier I mentioned using OTA to program your device. If you have already installed the OTA code prior to cutting the track, in theory you could finish at this point, and permanently forego the use of the USB port. In real life, things go wrong, and it is useful to have the option of going back to having a serial port. With this in place, you can re-enable the USB port for programming or debugging via the serial monitor. A note to the unwary: The first time I tried this I glued down the switch with epoxy. The problem is that, unless you are more careful than I was, a drop of epoxy becomes suddenly HUGE under these magnifications. The glue seeped into the switch, preventing it from working, and the NodeMCU ended up in the bin. Second time around I used super glue with more success. [Update 4 Sep 2016]: I have replaced the switch with a simpler and more reliable solution: a jumper. [Update 28 Jan 2017]: Thanks to Willem Jansen for suggesting this approach in the comments below. It turns out that the cp2102 UART has its own internal 5V to 3.3V regulator, which is not by default used by the NodeMCU circuitry, probably because it would not reliably supply the peak currents required by the ESP8266 (plus any associated circuitry the user might add around the NodeMCU). As explained in section 10 of the cp2102 datasheet, the cp2102 can be “configured as either a USB bus-powered device or a USB self-powered device”. To reconfigure the chip to use USB power requires isolating the VDD pin (break at X1) in addition to the X2 break described earlier, followed by permanently wiring the Regin pin to USB 5V (Wire3). You can see on the right what this looks like. The extra PCB break really adds to the difficulty, even under 10X magnification. Once complete, the UART will only draw power when the USB is connected for programming / debugging. Certainly this is a more elegant solution and convenient to use – offset by the extra time and effort required to make the mod. Depending on how often you plan to update firmware or debug will determine which approach is optimal – you decide! I need to warn you that after I implemented option 2, I found that intermittently the ESP8266 does not seem to boot up after applying power. Thanks to Mario Valentino – in the comments below – who found that a disconnected UART can pull the ESP8266 TX pin low, causing intermittent booting problems (as hinted at under “Desired level during power on” in: http://microchip.ua/esp8266/ESP8266_Module%20Application%20Design%20Guide.pdf). What I find strange is that in theory this should also be the case for option 1, yet I did not experience that. The solution is to place a resistor between TX and 3.3v, as shown on the right. Unfortunately this does waste some power. Choosing 1MΩ minimises this to an additional 3uA, bringing the total deep sleep current consumption of the NodeMCU to between 22-23μA. To be able to measure the small currents, I made use of the excellent μCurrent Gold. You may correctly point out that 50μA is still several times higher than what should be achievable with just the ESP8266 alone. But for what I am doing it is good enough: (theoretically at least you could get towards 10 000 hours from a small 500mAh Li-Ion cell, depending of course on what you do during the wake up periods, and preferably only infrequently using Wi-Fi. [Update 28 Jan 2017]: While testing option 2 above, I was powering only the NodeMCU (i.e. without the additional HX711 circuitry used previously). I measured deep sleep current at 20μA! In my next post, I’ll put this into practice, with full code. Interesting — it is a bit surprising that the CP2102 consumes so much power. The datasheet seems to indicate that it operates in a low power mode from reset until USB enumeration. Look for SUSPEND in the datasheet. I’ll run some experiments as well. Yes, I saw the SUSPEND lines mentioned in the datasheet, but they are outputs only. Suspend seems to triggered when “signaling is detected on the bus”. So I tried removing all “Serial” references in my Arduino code and also not plugging in a USB cable, but to no avail. Report back if you have any success! Thanks for the great post! I’ve been tearing my hair out today trying to figure out why I could get that reported 70uA! Did you ever get a chance to follow up on the question of the CP2109 power consumption in suspend mode? I just added a longish comment about suspend mode further down. Couldn’t get lower than 450µA though, as the CP2102 still draws 330µA in suspend mode according to the datasheet. Hi, I’d like to use LiFePO4 batteries, but what is the minimum operating voltage of NodeMCU? What if battery voltage drops to 3v or less? Thanks, I hadn’t heard of that type of battery – will check it out. This is why i wish someone would come up with a proto and go version of nodemcu. Socket the actual nodemcu board for the ESP8266-12E and then sell a second board with just the socket wired to pins. Build and debug your prototype in the nodemcu and when complete pop the 12E out and into the socket only version. I have seen several 3d printed sockets but think we are still a ways off. http://www.thingiverse.com/thing:1333056 for example but the pins used arent something standard off the shelf. Hmmm I wonder what one of these draws current wise without the serial board. Time to order one. Haven’t stop to play with ESP8266 in the Low-power world, but I wonder how much time/energy it would used to connect to an Wifi network and send a simple message… keen to see the following post! I have ESP01 powered with 2000 mAh power bank and AMS1117. It lasts about 10-12 days waking up every 5 minutes for 10 seconds to connect to wifi, read DS18B20 and send data both to local MQTT and ThingSpeak. I was wondering if you could improve the running time by removing the LDO and also reduce time 10 seconds for just a few Milliseconds… I’m currently running an old version of the board I mentioned above for over 1.2 years on 2xAA. I know it’s not the same an it can’t send metrics directly to the Internet without a gateway but might be room for some improvement on the ESP8226. Other thing is the power bank, rechargeable batteries normally have a bigger self-discharge rate when compared with non-recharchable ones. I’m not sure if ESP8266 can survive direct connect to LiPo battery as it’s voltage can be up to 4.2 V. In my case the longest step is WiFi connection, it takes about 5-6 seconds. Reading sensor and sending data adds 1-2 seconds. And I forgot to mention I’m using NodeMCU firmware running my Lua scripts. Probably clean C code could do the job much faster. I’m pretty sure it is better to use simple broadcasting radio like 315/433 MHz or NRF24L01+ to save time on AP association, though I have not tried them yet. never even once had any issue. that would be 15 modules working simultaneously at 4.2V for 2 years straight. never too hot, but as expected warmer than 3.5V for instance. no fan no heat sink needed for my usage, but do ensure good exposure to air at room temp. could you divulge which spefici battery you are partial to…? My proposal would be: Cut the UART power lines as indicated, scratch away the Vcc-pin and connect the REGIN pin (pin in the bottom left corner) to +5V from the USB directly. This way, the SILAB IC is only active when you attach a USB device – without necessitating any jumper at all. USB bus-powered device or a USB self-powered device”. I will give your approach a try to confirm, and then update the post with this alternative. Great article. I want to reduce the power consumption of my ESP8266 NodeMCU as well and I am going to try Option 2: Power UART from USB (no switching required). I have one question though, do I need to still do the other adjustments as well, or does this suffice? Kevin, for option 2 you still have to first make the mods described before the “option 1” heading. Just be aware that “option 1” is definitely robust and proven – and has been running my IoT device (https://tinker.yeoman.com.au/2016/07/24/iot-container/) for almost 6 months on a single charge of a 14500 cell. However, I only tried option 2 last week and experienced some strange intermittent issues with the NodeMCU not booting – so cannot be as confident of its reliability. I observed the instability with option 2 as well, especially when using deep sleep. About 1 in 3 times the module does not reboot after deep sleep when the CP2102 is unpowered. Solution: Pull up the TX pin to 3.3v with a 10K resistor (higher may work as well). By disabling the CP2102 the internal pull up is gone as well and the ESP becomes unstable on boot. I’ll confirm and update the post. First of all, thank you Tinkermax for a brilliant tutorial. I have followed Option 1 except I did not remove the voltage regulator, so I can still use a 5V powerbank. Unfortunately, my NodeMCU v2 does not boot without the jumper connecting the track I’ve cut. The blue LED does not even blink and the device draws about 35mA forever. If I wait for the LED to blink before I remove the jumper, it boots normally and when it falls to deepsleep, the current is 2.3mA (rather than 10mA when UART chip is connected). I also tried to solder a 120kOhm resistor between TX and 3.3V but nothing has changed. Does anybody have any idea what prevents my NodeMCU from booting? Do you think removing the voltage regulator makes any difference? Thanks. Update: I have also removed the voltage regulator, so now it’s the Option 1 unmodified, but nothing has changed. Still doesn’t boot with the UART chip disconnected. One possibility: are you putting the NodeMCU into deep sleep in your test software? If so, I found that I had to short 3.3v to ground briefly (with the power off / disconnected!) to cycle the NodeMCU. This is because the current draw is now so low that the onboard caps hold the ESP8266 powered in deep sleep mode for some time… so it can appear not to boot when you reapply power. Thank you for your tip. I do put the NodeMCU into deep sleep. But it’s the same no matter if I put it into deep sleep or if I just disconnect the power supply. I tried to short 3.3V to GND before connecting the power supply briefly but it’s still the same. I also tried to measure resistance between 3.3V and GND with the NodeMCU off, and found quite surprising that the resistance was only around 1kOhm with the UART chip connected (jumper present), and around 2.5kOhm with the UART chip disconnected (jumper removed). Is this normal? Thanks. Unfortunately, I don’t have another v2 for reference. I am going to try if I can use a PNP transistor to connect the UART chip only when the NodeMCU is running, and to disconnect it to save power when it goes to sleep. Needed 10k between tx and 3.3v for reliable booting/wake from deep sleep , otherwise it shows ~30ma always. 1) 2.3ma in deep sleep with CP2102 unpowered and AMS 1117 regulator still populated. I want to provide supply to NodeMCU ESP8266 (v0.9) from powerbank (5000mah,10000mah and 20000mah and each has 2 ports). How could i achieve this ? Purpose is to build robotic car so that using mentioned power bank ( one port goes to controller via to motors(Wheels) and other would be connected to ESP8266 ). I require support and assistance . Nice tutorial got my esp8266 node mcu running without the 1 M ohm resistor and it’s consuming a 13 micro amps in deep sleep SWEET! also i use a arduino uno without chip to program the sketch through rx and tx , so that could also be a solution number 4 for operation without uart. My adafruit Huzzah goes into a proper deep sleep power consumption level without requiring these hardware modifications. Would love it it someone knew of a similar board that is in the price range of the Amica style boards. I got down to 450µA (with the regulator removed but leaving the board as it is), by using a custom made USB cable. For my use-case I wanted to run the NodeMCU from a battery-pack. Therefore I have a somewhat limited current but I’m not speaking coin-cell-limited. My 1st attempt (UNSUCCESSFUL) was writing the EEPROM of the CP2102 to change the value of “BUS POWERED” from NO to YES. Changing it worked well, but didn’t change the power consumption. Not sure if this can maybe be used to reduce the amount of cutting in option 2, or whether this is just a descriptor thing. But as I didn’t want to do any cutting, i gave up on this. My 2nd attempt (SUCCESSFUL) was sending the CP2102 in suspend mode. The 2 “SUSPEND” pins of the CP2102 sounded interesting at first, but those are status outputs only. But the DS2102 probably doesn’t detect that because there is no hub connected. Seldomly I noticed, that the DS2102 was not going to suspend right after connecting the USB-cable. I’m not sure why, but to make sure that the suspend-mode is enforce I could pull-down “D+” to GND briefly after power up. When removing the regulator and powering the 3.3V directly, the DS2102 still needs to be powered from the USB connector to go into suspend. Plugging in and out the USB connector a few times, makes the DS2102 exiting suspend. It can be re-entered by briefly pulling low “D+”, as mentioned above. Yikes! We good info and great sleuthing of datasheets! I have an Adafruit Huzzah32 (esp32) and it has the same issue: consumes 6.5mA in deep-sleep due to the cp2102. As mentioned in my previous comment I had the same issue on an Adafruit Huzzah32. Unfortunately the trace that connects VDD to REGIN on its SIL CP2104 chip runs under the corner of the chip, so there is absolutely no way to cut that trace (without removing and replacing the CP2104). I did some experiments with the USB D+/D- lines and what I found is that grounding D+ _increases_ power consumption, but grounding D- _decreases_ it. I ended up wiring a 47K SMD resistor between ground and D-. The result is a deep-sleep power consumption that dropped from 6.5mA previously to ~250uA. It’s not where a good esp32 board should be, but it’s 25x better than before! The pull-down does not appear to interfere with USB operation (I haven’t tried a very long cable, though). Thanks again for your info, I would have never figured this out without it! Thanks for this great article. I ran into the same problem with the NodeMCU v3. Rumpeltux: Thanks for posting that – good to know that something similar is possible with the NodeMCU v3. Could you please tell how exactly you connect 3.7V (4.2V max) Li Ion Battery into 3.3V input. Doesn’t it brick ESP8266? Diagram would be nice. Anti: If you have a look at my other posts (e.g. https://tinker.yeoman.com.au/2016/07/24/iot-container/ or https://tinker.yeoman.com.au/train/ ) you will find circuit diagrams. I use a diode (e.g. 1N4001) to drop the voltage by nominally 0.6V, which reduces the fully charged 4.2V Li-ion to 3.6V – which is within the tolerance of the ESP8266. It is not a “perfect” solution (e.g.compared to using an LDO like the CAT6219) but is very simple and efficient. I have a analog-ish kludge that I found useful for low-power drain. I used a solar powered USB battery pack (available anywhere) to power a Nodemcu. The battery pack only outputs 5 v when there is sufficient load (~50 ma), or for 20 seconds after a switch on the pack is depressed. I jumpered across the switch with a PNP transistor that is driven by a cmos 555 timer powered directly from the li-ion battery. The timer fires, the pack turns on for 20 seconds – the Nodemcu starts, sends my data and goes to sleep (8-10 sec). With minimal deep sleep load, the battery pack turns off till the next timer cycle (5 minutes). The 4 extra wires (battery and switch) are a pain, but the 555 load is only 75 ua and I think it will run forever, as long as the sun shines. Hello, you can use TPL5110 use only 35nA you can specify the time to start/stop only with a resistor from 100ms to 7200s. 2. I make use of the ESP8266 RTC memory, which retains key variables during deep sleep mode to activate Wi-Fi only when something has changed. Using the TPL5110 would require saving to flash – with potential number of write cycle limitations. Ron, I like the simplicity of your solution – when there is solar energy available (unlike inside my fridge). Thanks for sharing! I’m looking for absolute minimum power consumption to do some tests running on supercaps. I have replaced the AMS1117 with the HT7333 being able to power via usb-connector and use option 1 to switch off the CP2102. b) would be partially powering up the ‘off’ CP2102 via it’s substrate diodes on the RXD input – yuck ! Could damage it eventually. Instead I’ve come up with an Option 3 that appears to work quite well. 1) Cut the track to TXD0 between the ESP module and the CP2102, but on the ESP side of the via that goes to “TX” pin on the header. 2) Run a schottky diode such as 1N3132 from TXD0 pin on ESP module (pin 22 is the last pin) to the TX header pin (which still connects to the CP2101). 3) A 1k pullup from TX ideally would go to VDD (pin 6 on CP2102). My soldering gear isn’t up to getting a wire onto VDD as well as onto REGIN, so instead I took the pullup to Vin on header (about 4.8V after the sk diode from Vbus), and ran a ~3.5V zener to ground so the voltage on TXD0 doesn’t exceed 3.3V or so. You could use two 1N4001s in series from Vin to the 1k instead, if you don’t have a convenient zener lying about. The fairly aggressive 1k pullup is need to ensure the port still works at 115k, but we don’t really care about the current here as it’s from Vbus. Now the TXD0 pin on the ESP module can happily be pulled high by the weak internal pullup when sleeping, till it becomes a real TX pin output when running. I’ve since found, using a slightly different PCB cut, that the 1k pullup can easily go to the regulated 3v3 from the CP2102. The two bypass caps are included on the 3v3 regulated output too, which is much better. You need to isolate *just* the REGIN pin with the cut, but VDD remains connected to the bypass caps. To the side of the larger bypass cap, you also need to cut the track that connects this VDD to the 3v3 on the NodeMCU. Add a new bypass cap on NodeMCU 3v3 on the pads of the removed regulator (to mkae up for the ones just removed from the 3v3 circuit above). PS: If you don’t have a schottky diode on hand, a small signal germanium detector diode (crystal set diode) works fine also. Oops, I should mention the schottky points towards the ESP TXD0 pin 22, so a low on the module results in an (almost) low on the CP2101, but when it goes high, we are relying on the pullup.